Pythagorean philosopher and necromancer; born about the year 3 B.C. ; died, according to some sources, in the thirtyeighth year of his age. In Arabic literature his name is cited in the form "Balinas" or "Belenus," which has often been mistaken for "Pliny." He is mentioned in connection with magical writings, and is called by the Arabs Ṣahib al-Ṭalismat ("The Author of Talismans"). They attribute to Apollonius "Risalah fi Tat'hir al-RuḦaniyyat fi al-Markabat," a work that treats of the influence of pneumatic agencies in the world of sense, and which also deals with talismans. An introduction ("Mebo") to this treatise on talismans, "Iggeret al-Ṭalasm," was composed by an anonymous writer; it is found in Steinschneider MS., No. 29. It is full of Arabic words, and contains a few Romance ones also. The translator says at the end that the whole book is of no value, and that he has translated (or copied) it merely as a warning against "serving strange gods." It is probable that a copy of this translation existed in the library of Leon Mosconi (Majorca, 14th century), where it seems to occur under the title "Bel Enus"—No. 37 of the catalogue ("Rev. Et. Juives," xxxix. 256, xl. 65). It is also cited by Joseph Nasi (16th century) and perhaps by Abba Mari. According to Johanan Allemanno (died 1500), Solomon ben Nathan Orgueiri (of Aix, Provence, about 1390) translated from the Latin another work on magic by Apollonius. 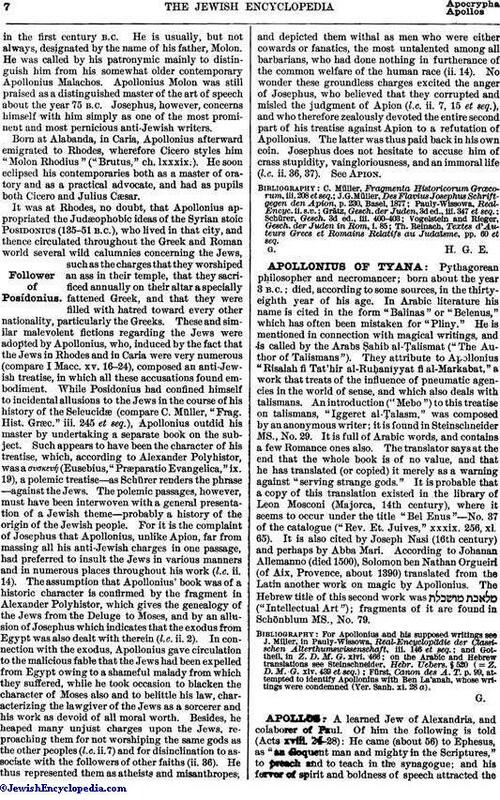 The Hebrew title of this second work was ("Intellectual Art"); fragments of it are found in Schönblum MS., No. 79. Fürst, Canon des A. T. p. 99, attempted to identify Apollonius with Ben La'anah, whose, writings were condemned (Yer. Sanh. xi. 28 a).